I wasn't going to bother turning out last weekend, but a mate of mine suggested the fish would be feeding up to beat the cold weather that was on the way. Like a fool I took his advice and headed out on Saturday afternoon for a short session. The only good thing about it was the lack of rain. The wind was howling out of the east and, although it wasn't actually freezing, sure to be cooling the water. At least I was able to fish my baits accurately and it wasn't long before the left hand rod signalled a jiggling bite. Lifting into the fish it felt like a real good one. A few shakes of the head suggesting it wasn't another of those odd carp things. It was coming in nicely until it got half way back when it swirled on the surface. My suspicions were aroused. Closer in and it rolled leaving me with spots before my eyes. When it hit the margins it took off to the left making me backwind like mad. There were a couple more runs like that from the net, one going round the line on the middle rod, before I had the daft thing on the bank. Where it went mental. 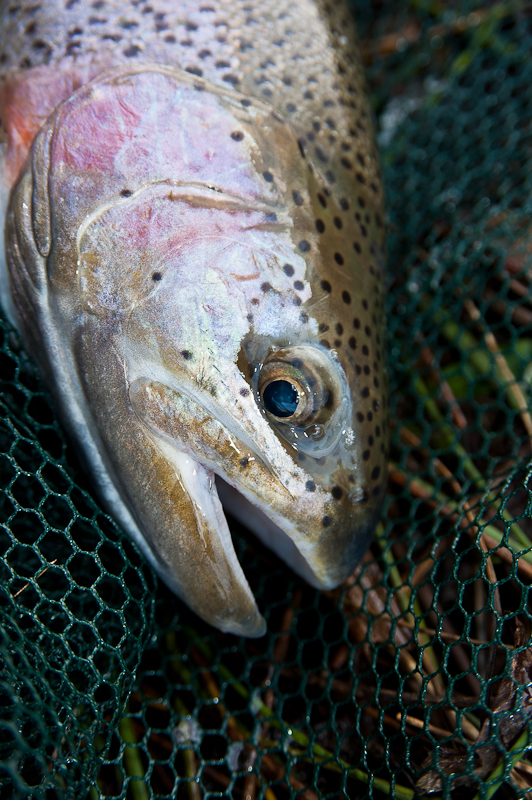 It's no wonder people kill trout when they catch them. It must make getting the hook out a lot easier. As it was this one unhooked itself in the net. Or so I thought. After I'd returned the fish and was sorting the mess out I discovered the hooklink had snapped. With everything back to normality I settled down to the routine of recasting the cage feeders at regular intervals and drinking tea. There wasn't much birdy activity. Too cold and windy I reckon. I'd managed to pick a spot that gave me some shelter from the Siberian blast, so sitting it out until dark wasn't a great hardship. Recent sessions had seen a chance of action around three o'clock. When the left hand bobbin dropped back around the witching hour I thought I was in business. Lifting into the fish there was a heavy weight, a few head shakes, but a horrible feeling of déja vu. Sure enough when the fish hit the margin it tore off, this time along the surface. I began to get a strange feeling that this was the same stupid trout. In the net and probing for the hook with my disgorger, sure enough, there was the hook that had snapped off in the net right next to the one attached to my rig. After removing both hooks I returned the fish hoping it would have had enough of my maggots for the day. The sky was clear and it was still fairly light when I finally gave in and packed up at five.